Home LifestyleLocal	Green Acres Farm: It’s Corn Maze Time! A couple years ago, Jerry and I visited some of his family in Ohio. They lived on a Farm at the time and it was Fall. We camped out, cooked out and chilled out. It was awesome. We took a hay ride and around the corner at the next farm over, we went through a corn maze with the whole family. It was SO much fun! I loved mazes as a kid and the idea of a corn maze is just the coolest thing. 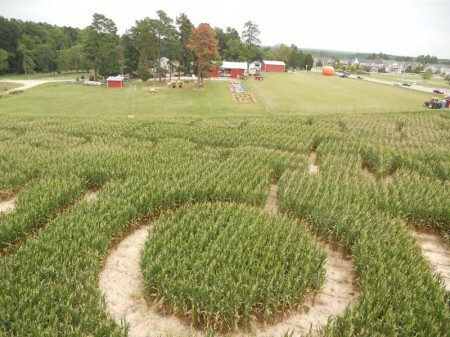 This year, one of North Carolina’s local Bloggers is opening up her own family farm and corn maze! I had the privilege of meeting Beth at an event earlier this summer and her farm has been in the family for 100 years. It’s called Green Acres Farm and it will be open for the whole season with some awesome activities for the whole family including the 6 acre Corn Maze! I am so excited for Fall! It is possibly my favorite season of the year. I already have a pumpkin on my front steps and now that the rain is hopefully bringing some cooler weather I am ready to embrace it. I can’t wait to check out Beth’s Farm! You can stay in the loop on their website or check them out Green Acres Farm on Facebook. Oh man, that sounds like something my 3 year-old would LOVE. Might have to go check them out this weekend. Thanks for posting this, I had no idea it existed and it’s only a few miles from us! Seriously, I can’t wait. I never knew it was there either! We have that around here, too. I keep saying we’re going to do it and then it’s too late. I STILL want to! Thanks for posting! Let me know when you’re coming out and I’ll have tickets waiting for you! The rain has made our corn shrink down, but it will still be a lot of fun! I love fall too. Just the greatest time of year and everything seems to fall into place. Have fun and can’t wait to hear how it was!